Formulas are equations that perform calculations on values in your sheet. All formulas begin with an equal sign (=). You can create a simple formula by using constant and calculation operator. For example, the formula =5+2*3, multiplies two numbers and then adds a number to the result. When you want to refer to variables instead of constants, you can use cell values, for example, =A1+A2. If you are working with long columns of data, or data that is located in different parts of a sheet or on another sheet, you can use a range —for example, =SUM(A1:A100)/SUM(B1:B100), which represents the division of the sum of the first hundred numbers in column A by the sum of those numbers in column B. When your formula refers to other cells, any time that you change the data in any of the cells Excel recalculates the results automatically. You can also create a formula by using a function, a predefined formula that simplifies entering calculations. Equal signs start all formulas. Constants, such as numbers or text values, can be entered directly into a formula. Operators specify the kind of calculation that the formula performs. For example, the ^ (caret) operator raises a number to a power, and the * (asterisk) operator multiplies numbers. Functions are premade formulas that can be used alone, or as part of a longer formula. Each function has a specific argument syntax. Cell values let you to reference an Excel cell, instead of the specific value inside the cell so that the contents of the cell can change without the function that refers to the cell having to change. In a sheet that contains columns of numbers, click the cell where you want the formula results to appear. Click the first cell that you want to include in your calculation. The result of the calculation appears in the cell. Tip: To quickly apply a formula to the next cells down in the column, double-click the fill handle on the first cell that contains the formula. In a sheet that contains a range of numbers, click the empty cell where you want the formula results to appear. Type an equal sign and a function, for example =MIN. MIN finds the smallest number in a range of cells. 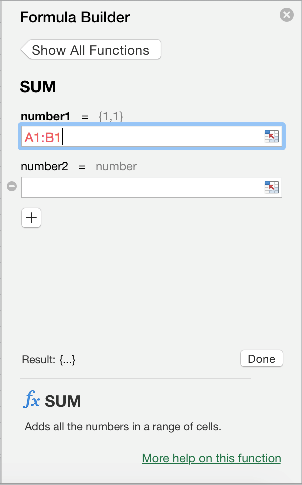 Type an opening parenthesis, select the range of cells that you want to include in the formula, and then type a closing parenthesis. In our example, the MIN function returns 11, the smallest number in cells A1 through C4. When you enter a formula in a cell, the formula also appears in the formula bar. Select to check your formula. If there are no errors, the cell will display the result of the formula. If there are errors, you'll see . Hover over it for an explanation of the problem, or select the drop-down for additional troubleshooting help. Select to revert to your previous formula. To select a function, use the function list. When you select a function, the Formula Builder opens, with additional information about the function.